NOAA weather alert feature with weather scan to keep you apprised of the conditions in your local area. Packed with features, the Midland GXT2050VP4 two-way four pack makes an outstanding addition to your outdoor or emergency kit. This rapid-charging two-way set lets you stay in contact with your party and helps to keep you safe, with useful features like SOS, NOAA weather alerts, and a long range. The Midland GXT2050VP4 boasts an Extreme Lithium polymer battery pack that takes only 2 hours to reach full charge. As an added bonus, this long-lasting battery holds its charge until you need it, making it a smart choice for use in an emergency. And, so you never run out of juice unexpectedly, these two-ways have low battery indicators. What? You Don’t Have Night Vision? Not a problem! Thanks to its backlit display, you can comfortably use this Midland model in darkness. To make sure you’re prepared in the event of an emergency where you suddenly find yourself needing assistance, the Midland GXT2050VP4 helps you out. It’s got a loud SOS siren, so other members of your community know you’re in need of help and can hone in on your location. This two-way radio boasts an impressive maximum range of 36 miles under optimal conditions – a clear line of site with no obstructions and minimal interference across land or water. Thanks to the use of HD Dynamic Audio, your communications are received in loud, clear digital audio. You’ve got 22 main channels plus 28 extra ones and, when combined with its 142 privacy codes, you’ve got a total of 3,124 channel combinations to choose from, so you can easily talk to your group in private. This model also features channel scanning, making it super fast and simple to find a vacant channel. Instead of repeating yourself each time you speak, with “Roger” or “Over”, or whatever hilarious phrase your group has come up with, you can simply make use of the Roger Beep function. For those times when you need to stay quiet – whether it’s because you don’t want to frighten the deer you’ve been stalking, or because you don’t want to give away your location to potential hostiles, you can switch the two-way to Silent Operation that also includes a vibrating alert in the event you receive a call. This lets you stay in contact with your group, particularly if you’ve got the headset plugged in, without making a lot of unnecessary noise. When you need to talk to your group – but quietly – you can use Whisper Mode, which lets you (you guessed it) whisper, but still be heard clearly by the remainder of your team. When your hands are occupied, use the Midland GXT2050VP4 hands-free. With eVOX technology, you’ve got 9 differing levels of hands-free operation so you can stay in contact with your team while your hands remain unencumbered. Use this function in conjunction with the headset (which includes a mic), for maximum versatility and convenience. 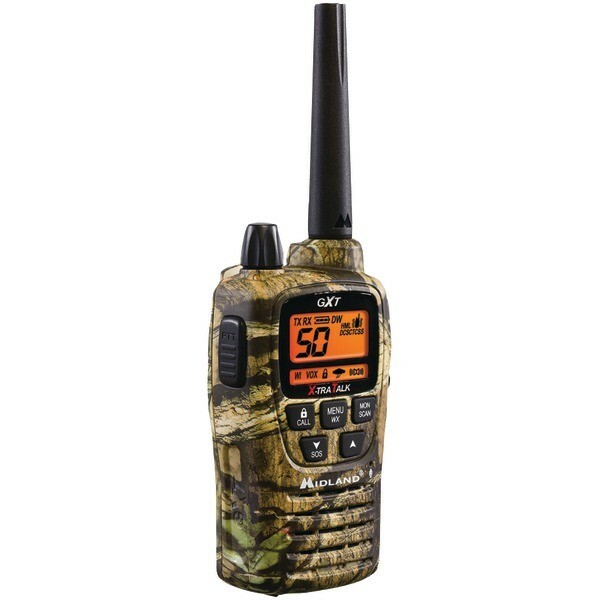 The Midland GXT2050VP4 boasts NOAA weather alert radio functionality as well as Weather Scan. When enabled, this feature automatically finds your local weather channel and provides you with emergency alerts. If you want to conserve power, you can deactivate this function. It’s also splashproof, so it can withstand light rain and splashing water. 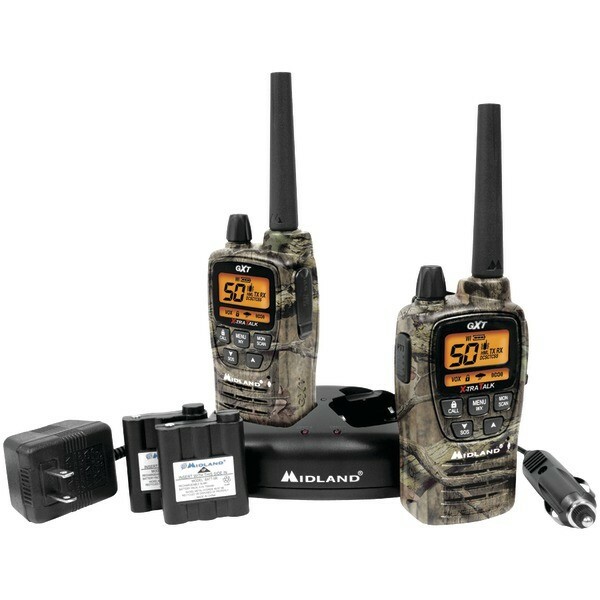 Whether you want a set of two-way radios for your hunting kit or your bugout bag, the Midland GXT2050VP4 is a great choice. With four radios in the kit, you can confidently give your spares to other members of your party, or to each member of your family so you can all stay in constant communication, whether you’re enjoying a weekend in the wilderness or in an emergency scenario. The Midland GXT2050VP4 22-Channel 2-Way Radios are a pair of affordable, versatile radios for outdoor communication. 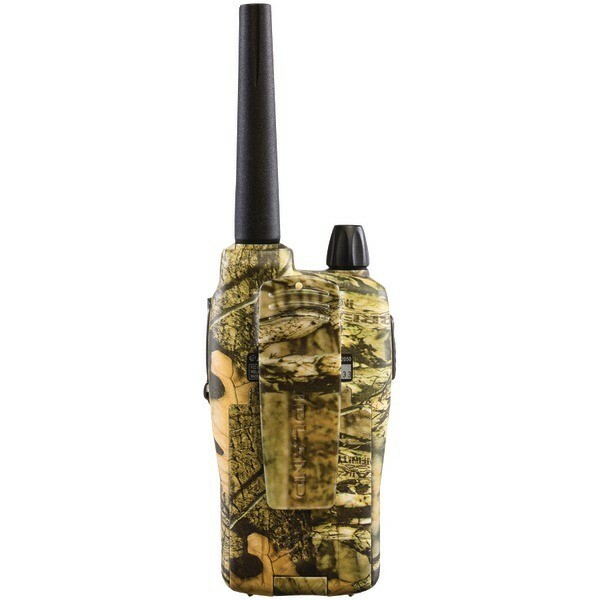 The radios feature a camouflage finish and are an ideal choice for hiking, boating, hunting, fishing and much more. There are 22 channels (with 28 additional) and a 36 mile range with little obstructions. The Midland GXT2050VP4 is designed with state-of-the-art high-tech engineering and suitable for GMRS (General Mobile Radio Service) operation. This radio is skillfully constructed with the finest components and its solid state circuitry is mounted on a rugged printed circuit board for maximum durability. 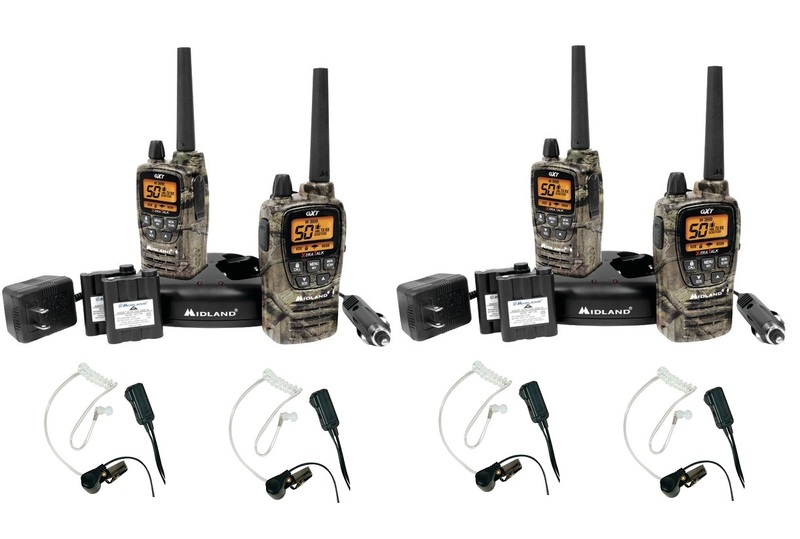 The radios feature JIS4 waterproof protection against light rain and splashing.The transparent headset in the bundle can be used in the security business, hunting, fishing & various other activities. NOAA local weather alerts keeps you abreast of weather conditions and whisper mode allows for quiet yet audible speech. In addition e-VOX operation supports hands-free communication (9 levels) and a pair of headsets are included. The radios include lithium polymer battery packs for long battery life and a full charge in just 2 hours. A dual bay charger, headsets AC and DC adapters are also included. GXT2000/2050 Series radio operates with a Li-Polymer battery Pack (BATT12Li) which can be recharged using a 18CVP13 desktop charger. For maximum battery life, we recommend charging the battery pack when the low battery icon comes on. GXT2000/2050 Series has a BATTERY LEVEL METER that shows the battery power level. The greater the number of bars visible, the stronger the battery level. GXT2000/2050 comes with useful features such SOS siren function which will send out a loud siren sound and the display backlight will flash. Also, it can scan all 50 channels for activity and stop on any active channel and the radio will resume scanning after 4 seconds when the channel is no longer active. Your GXT2000/2050 Series has 142 Privacy Codes available which can only be used on channels 1~22. The selected Privacy Code may be different for each channel.This two way radio has a SILENT OPERATION mode. This will be very useful if you are hunting or bird watching. Midland GXT2000/2050 Series has a NOAA WEATHER RADIO function, to enable the user to receive weather reports from designated NOAA stations.Two way radio also has a NOAA WEATHER SCAN function, to enable the user to scan all 10 channels of the NOAA weather radio.